I gained a lot of weight this year and I really want to stay at a healthy weight but look my best. How can I lose some weight but stay healthy? Posted 10 January 2018 under Ask Us. There are a lot of factors that influence your weight that are out of your control, like genetics (the body size and shape of other family members). However, you do have control over some factors that impact your weight such as the amount of sleep you get, stress levels, exercise, and eating habits. By getting enough sleep, you will have the energy you need to make healthy food choices and move your body in a way that feels good, whether it’s dancing, swimming, or playing soccer. Managing your stress, whether you like to journal, practice yoga, or talk things out with a friend or family member, can also prevent you from stress or emotional eating. Fueling your body with a balance and variety of foods is also important to feel your best physically and emotionally. 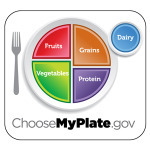 MyPlate is a great resource to help you plan and prepare healthy meals and snacks by focusing on whole grains, lean proteins, fruits, vegetables, and low-fat dairy. Making small changes such as drinking less sugary drinks and eating more fruits and vegetables are much more effective long-term than any fad diet. It’s important to remember that some weight gain during your teenage years is normal and essential in order for you to grow and develop into a healthy adult. Before trying to lose weight, please talk with your primary care doctor to be sure that weight loss is safe for you.